Plankinton House Hotel Lobby. Image courtesy of Jeff Beutner. 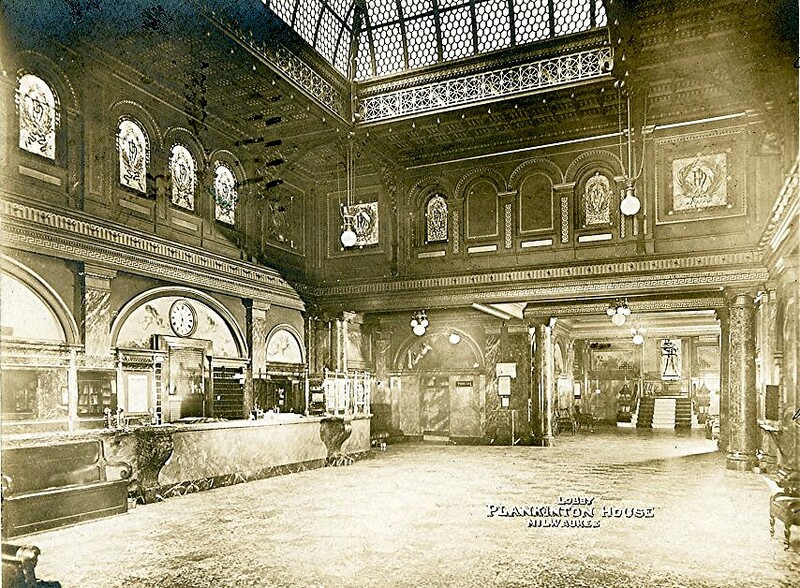 The Plankinton House reigned as Milwaukee’s premier hotel for quite a few years. Competitors, like the Pfister, would not arrive until the early 1890s. In the mid-1880s, the west side of the river would thrive, providing a home for department stores like Gimbel’s, Boston Store and Espenhain’s. Customers arrived via rail and streetcars. Around 1908, the hotel produced a series of photographic postcards. Two examples are illustrated here. The first is the lobby, which was a quite impressive sight with the hotel’s initials in mosaics and a glad-paned dome. A bit different from the reception area at the Aloft. There were several dining and reception areas, including one for the men, which had a bar and was very cigar-friendly. 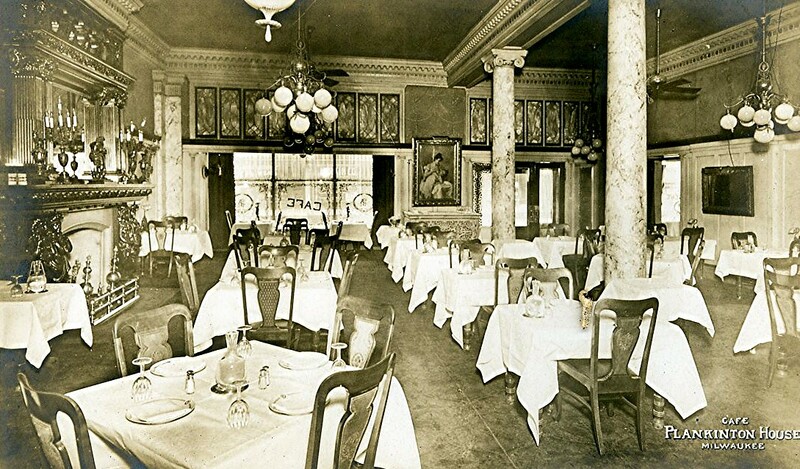 This view is of the other modestly titled ‘Café.’ Note the marbleized columns and a fireplace mantle that would have been suitable for John Plankinton’s own mansion, located at 15th and Grand Ave. (now Wisconsin). But in 1915, this age of glory would come to an end. A new hotel would be constructed just to the south and the Plankinton House, with its roots to the 1850s, would be demolished. Plankinton House Hotel Cafe. Image courtesy of Jeff Beutner. My great great grandfather, Joseph Webber, was the master chef at the Plankinton Hotel for around 25 years until about 1904. If you have any photographs you could share with me I would be delighted to hear from you. I am planning a historical dinner at the Milwaukee Club and would like to replicate the menu of the Banquet held at the Plankinton House on Jan. 2, 1872. Would you have a copy of the menu or know where I might find one? I have a bottle of Cedar Brook Plankinton Reserve Whisky. Could anyone shed some light on a possible value? It is still in the original paper packaging.